Exquise yellow flower jacquard v neck asymmetric peplum hem dress. Features sleevelss cross over wrap style top with v neckline. Waist detailing with side bow, fitted on the hips with dropped asymmetric peplum hemline. Presented in all over pretty floral printed jacquard fabric. Exquise Coral pleated ruffle midi dress with contrast strap. Features pleated ruffle details on bust-line waist and the off shoulder sleeve. The skirt is fully pleated and to a below midi hemline. The dress is v front and back with a side concealed zip fasten. The under bust is plain fabric with little silver Exquise motif. Features contrast straps on shoulders. Exquise colour block peplum two piece. Stunning two piece outfit. Features bold triple colour block top made with v neckline, sleeveless cut and large peplum waist feature. The pencil skirt is midi length with back exposed zip. Exquise ivory and cream embossed two piece bustier top with capri pants. Features sweetheart strapless bustier top with covered front buttons and matching belt. Worn with matching capri pants with slant side pockets, waist band in ankle grazing length (model 5ft 9). All over cream and ivory embossed flower fabric. 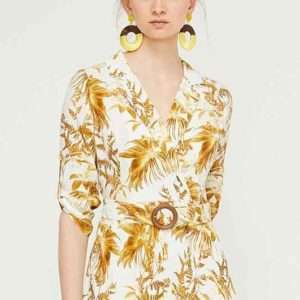 Exquise vintage flower print layered midi dress. Features blouse style v neck collar top with loop gathered three quarter sleeve. The skirt is layered and gently A lined and a complimenting belt cinches the waist. The dress is worn by a side concealed zip. 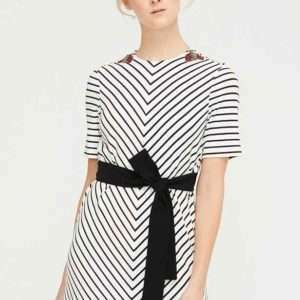 Exquise black and white striped A line midi dress. 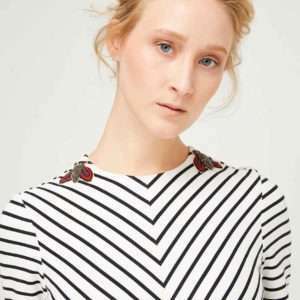 Features all over stripe jersey fabric with half sleeve on a midi A line shape. A high neckline with pretty beaded creatures on each shoulder. A black fabric belt adds shape to the waist. Simplicity mixed with eccentricity. Exquise lilac sleeveless button front pencil dress. A stunning little dress in the most gorgeous pale lilac tones. Simple and stylish its a dress to be worn time and time again that will take you to many of your up coming celebration days. A dress that will then go on to give you joy, worn casual with trainers and denim. A dress for life. Features large button front detailing on a pencil midi length dress. A v neckline with no sleeves and side sitting pockets to relax the look. The skirt has little pleated details at the top of your hips for a lovely shape and will flatter your tummy. Exquise pale green sleeveless side pleat midi dress. Simply chic. A beautiful dress that will suit so many occasions and give timeless wear and enjoyment. Perfect for your next wedding invite, party, graduation or special celebration day. Features the softest pastel green crepe fabric on a pencil midi length dress. The dress has a high neckline, no sleeves and features side pleating to create a lovely detail on the bust and waist. This is covered by a matching fabric asymmetric sash that cinches in the waist and adds shape to the dress. Exquise lilac strapless jumpsuit. A dream of a jumpsuit for your next wedding invite, party or special occasion. Features boned strapless bodice top with long front drape, leading to wide leg trousers. A waist cinching navy belt with back bow detail and side hidden pockets.